Before I finish with the topic of New Orleans, here are a few helpful hints that I wish I’d found somewhere, anywhere, before I started making use of the very useful St. Charles line. Get yourself a Jazzy Pass ASAP. Unless you’re just making one or two trips, it’s totally worth it. The fare boxes on the streetcars are painfully slow, and you need exact change. Paying cash holds up the line and makes you look like a tourist. You can buy a one-day Jazzy Pass from the streetcar conductor (cash only), but not the 3-day pass, which is available from various vending machines and retail outlets, or any Walgreens store in New Orleans. (There are Walgreens all over the place in NOLA.) The link I’ve provided gives basic purchase information. All the streetcars have “exit rear door” signs, but most people don’t do that because the doors are difficult to open manually. If you find yourself stuck in the rear of a crowded streetcar when you reach your stop, give that door a good, hard outward shove to open it – otherwise you’ll have the conductor and half the passengers shouting instructions at you until you disembark, and cheering sarcastically when you do. I have an app called Transit on my phone that I use at home, and it turns out that it works in New Orleans as well. It wasn’t super accurate about arrival times but close enough for a vacation, and it was somehow smart enough to figure out what direction I was heading in, so it turned out to be fairly useful. If you have that app, or a similar one, give it a try! Now that I’m back, I can share the reason that I selected a repost for last week’s blog entry – I was on holiday in New Orleans! While I’m working on a new savory Jell-O and accompanying video for next weekend, I thought I’d share a few highlights. It had been a long time since either Bryan or I had been to the Big Easy. I spent a couple of days there on my way from San Francisco to NYC in 2000, and Bryan was there for the World Science Fiction Convention in 1988. This time, we went partly because our friend J– had seized upon his daughter’s graduation from Loyola as a happy occasion for a gathering, to make a change from all the funerals. Our impression of today’s NOLA was mixed. There is a lot about NOLA that’s exceedingly cool (art, music, food, history…) but the drinking culture is kind of overwhelming. We got to experience it even before leaving Boston when a bro’s bachelor party, already underway, boarded the plane and settled into the row behind us. We saw many such groups in the French Quarter. The bachelorette parties were particularly easy to identify by their matching tee-shirts, festive headgear, and feather boas. There are few cities in the U.S. where public drinking is legal (of which NOLA and Las Vegas are the best known), and NOLA bars are allowed to stay open 24/7, so it’s a major drinking destination, and people do some major drinking there. We arrived on a Wednesday evening, hungry for some good Southern cooking. The desk clerk at our B&B, Creole Gardens, pointed us in the direction of Lafayette Square, where a weekly live music show would be winding down, and we’d be able to buy food from street vendors. Bryan didn’t care for the music, so we continued on to Canal Street and, as Bourbon Street was right in front of us, we decided to plunge on into the French Quarter. You don’t see this every day! I’m not going to apologize for saying this: Bourbon Street is awful. It’s noisy, smelly, and vulgar, and within a few blocks Bryan found himself in the clutches of a Shoeshine Man. There’s a scam where a Shoeshine Man bets you that he can tell you where you got your shoes, making it sound like he can psychically discern the state, city, and store where you bought them, but when he finishes winding up his pitch, it turns out that “you got yo’ shoes on the bottoms of yo’ feet”. Ha! And while he’s doing that, if the shoes are leather, he squirts polish on them so that you have no choice but to let him shine them. We had already learned about this scam because a friend of ours fell for it when he was in NOLA a couple of years ago, but Bryan forgot, and got soaked for a cool $20. We spent far too long wandering pointlessly in the French Quarter before we headed back to the Garden District, to wind up having supper at Seed, a vegan restaurant across the street from Creole Gardens. We agree that this was the best meal we had in NOLA. Creole care for cooking does wonders for vegan cuisine. The food was just beautifully done, excellent flavors, and the restaurant was maybe a little hipstery, but friendly and welcoming and comfortable – a good start to the trip. We had most of our breakfasts at Creole Gardens, and they were excellent. Barbara’s grits and biscuits are top-notch. On Friday and Saturday morning we weren’t able to get up in time for the B&B breakfast, so we ventured out to the neighborhood, hitting the Trolley Stop Café (notable for its dark-colored coffee cups that made pouring difficult for our waitress) and the St. Charles Tavern (notable for being nearly empty late Saturday morning, although the food was good). Over the course of the six days we were there, the quality of the food was surprisingly inconsistent. An early lunch on Thursday at the Café Fleur de Lis (I had gumbo, Bryan had a shrimp p’ boy) was very good, but that evening we found ourselves part of a group of 13 with no dinner reservations, and we ended up at the Café Pontalba, which deserves props for accommodating us quickly, but alas not for the food. The Spicy Green Beans were a serious fail. We fared much better on Friday with a late lunch with friends at the Gumbo Shop (which I remembered fondly from my last visit to NOLA – lovely pecan pie) and a very, very late supper with them at the 24-hour Daisy Duke’s on Chartres Street. Eating a big bowl of gumbo and having a long, punchy conversation about vampires, zombies and ghosts with our friends’ 12-year-old daughter and 16-year-old son was one of the highlights of the trip. Friday turned into such a late night because J– had organized a “ghost and mystery tour” for the party guests with Jonathan Weiss, the New Orleans Ghost Tour Guide to the Stars, as described by Key and Peele on Jimmy Kimmel’s show while promoting their film Keanu. Jonathan is a charismatic and skilled storyteller (though he could’ve skipped Brangelina’s house). Locations on the tour included the house of Madame Lalaurie (inspiration for “American Horror Story: Coven”), Lafitte’s Blacksmith Shop, Madame John’s Legacy, and the Old Ursuline Convent. The history lesson were interesting, but the upshot seemed to be that anyplace where someone has died might be haunted. Actually, it’s not hard to believe that New Orleans is haunted, and I expect that the complete absence of ghosts on the tour might have been down to the masses of tourists drinking up a storm everywhere we went. If I was a ghost, I would have stayed holed up in an attic, too. While we got sucked into the French Quarter far too often, we did manage to spend some time in the Garden District. The graduation party was at a house J– had rented, and that turned out to be a nice, relaxing time hanging out with old friends and meeting cool new people. One day we visited Lafayette Cemetery #1, where some of Interview with a Vampire was filmed. Bryan was disappointed at the lack of spookiness, though expecting a cemetery to be spooky at noon might be asking a lot. He’d learned that part of the reason the tombs are above ground (aside from the well-known high water table) is because the older cemeteries in NOLA are modeled on Père Lachaise Cemetery in Paris, where many of the graves have small chapels built above them. The graves in Lafayette #1 are more modest than most at Père Lachaise, and more uniform. Lafayette #1 is also small area-wise, because those tombs are often shared by many family members. We followed up Lafayette #1 with lunch at the St. James Cheese Company, and dessert at Creole Creamery, which has exotic flavors to rival anything we might find at Toscanini’s here at home. One of the things I love about the American South is the folk art, and we managed to see a good bit of that while we were there. We visited the Ogden Museum, just down the street from Creole Gardens, and browsed the galleries on Royal Street looking for the work of Dr. Bob (which I’ve loved since I picked up one of his pieces in Memphis almost 20 years ago). We went to the old U.S. Mint over on Esplanade Street, where the ground floor houses an exhibit on the history of the mint (including why it’s not a working mint anymore), and the second floor has art exhibits – at the time we visited, one gallery had an exhibit of Southern outsider art, and another had a really good exhibit on native son Louis Armstrong. We even made a visit to Madame John’s Legacy in the daytime, while it was open to the public (and free!) It seemed even less haunted in the middle of the day, but we like antique houses (we used to own one) and there was a nice exhibit on Newcomb Pottery (I have a weakness for the Arts and Crafts movement). And yes, we did finally manage to round out our trip to New Orleans with the obligatory visit to the Café du Monde for beignets and café au lait. or, Dude, Where’s My Parsley? 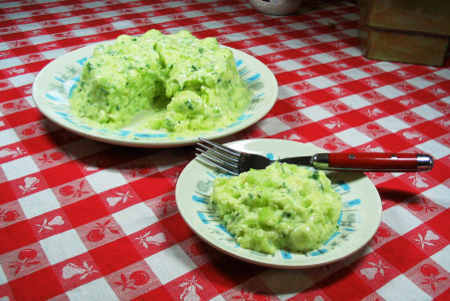 Here we enter into the first of our regularly-scheduled savory gelatin dishes. I started with this one because it looked like the least scary one. It’s a simple cucumber salad, with a lemon Jell-O base and sour cream (I think yogurt could work with this as well), seasoned with a little vinegar, onion, parsley and black pepper. It sounds kind of like Indian raita or Greek tzatziki, so it seemed like it wouldn’t be too ridiculous. It was pretty easy to make, except for one problem – the recipe calls for the cucumbers to be coarsely grated, but we don’t have a box grater, just a microplane grater and a cheese grater. I tried using the microplane briefly, but I ended up with cucumber mush. In retrospect, I probably should have used the grating disk in our Cuisinart, but for some reason I thought that would be too much trouble, and I decided to finely chop the cucumber instead. I admit it, it did occur to me that this might make it difficult to drain enough liquid from the cucumber before adding it to the gelatin, but I went ahead with the chopping anyway. I drained, I blotted, I blotted some more, and finally, when the cucumber was not obviously weeping, I added it to the seasoned Jell-O and sour cream mixture. I poured it all into a mold lubricated with non-stick cooking spray, and let it chill overnight. That non-stick cooking spray has not turned out to be the saving grace I was hoping it would be. This dish wouldn’t come out of the mold after the first dip in a hot water bath, and after the second dip it took a good shake to get it out. Once again, there was a little too much melting needed to release the mold, so it ended up sitting in a little pool of liquid gelatin. This time I thought, no problem – the recipe had required only a tablespoon of chopped parsley, so I had most of the bunch left and could use it to garnish the Jell-O for the photo. I opened the fridge, looked in the crisper where I’d put the unused remainder of the bunch, and found only a lot of Polaroid film and a big bag of apples. Eventually we arrived at the truth of the matter – he had gotten a little over-enthusiastic about cleaning out the fridge that morning and had thrown out the parsley, for some reason assuming that it was old and no good. Argh. She canna hold much longer, Captain! The mold appeared to be nice and firm, so after I’d taken a few photos of the whole thing, I thought I’d get some of the mold with a slice of it on a small plate, ready to serve. Cutting into it, I discovered its lack of structural integrity. Nothing resembling a slice was going to come out of this, and as soon as I removed a serving from it, cracks began to develop on top and the whole thing began to slowly collapse. It really would have been better if I’d coarsely grated the cukes as it said in the recipe. Oh well. I ate the “slice” myself and gave Bryan an amuse-bouche in a custard cup. It wasn’t all that nasty. 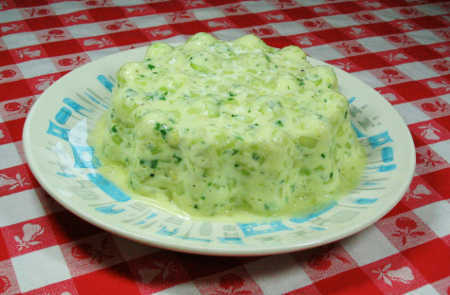 The savory ingredients do go a long way towards cutting the sweetness of the Jell-O, and it was somewhat reminiscent of other creamy cucumber salads. I found it rather refreshing, but Bryan said he wouldn’t go that far. If I were to make this again, I would probably add more pepper. However, I’m unlikely to make this again. Even though it wasn’t very nasty, it’s been sitting in the refrigerator growing increasingly formless, and we haven’t eaten any more of it since we tasted it. This one, I think, will be garbage disposal food. When I first started mulling over Jellied Prune Whip earlier this week, my thinking was that it would fit neatly into the theme of “aging” that seems to be evolving in NJoJ. What comes to mind when you think of prunes? Old people, of course. I puzzled a little over why prunes are associated with the elderly. I mean, if you think about it, it’s not immediately obvious – prunes are really just giant raisins made out of plums, and raisins (especially in those little packable red boxes) are often associated with children. My theory is that it has to do with the (relatively recent) idea that prunes are only used to relieve constipation, a condition that commonly afflicts older people, if the Metamucil ads are to be believed. (I can guarantee you that this is not an issue here at Freak Mountain.) Mr. Google told me that prunes contain mild laxatives as well as dietary fiber, although research shows that they’re only effective for, erm, maintaining regularity when three or four ounces are eaten daily. As I know now, that’s kind of a lot of prunes, even divided into two or three servings. Stop’n’Shop’s prune distributor has not jumped on the “dried plum” bandwagon. Mr. Google also told me that a lot of prune distributors have opted to use the term “dried plums” for their products to try to dispel that “nature’s laxative” image. Sunsweet even markets a product of individually-wrapped prunes (“Ones”) that it was promoting a few years ago as a sort of natural candy. I keep actual candy (Jelly Belly jellybeans, Skittles) at my desk at work, and after a lot of grousing by a co-worker about a lack of healthful snacks, I added a tub of Ones to the counter. It took ages for them to get eaten. The co-worker had some, as did I, but the students wouldn’t touch them. I don’t think “dried plums” are going to catch on anytime soon. This recipe sent me down a prune rabbit hole. The prune component is listed as “chopped cooked prune pulp”, as though any idiot would know what cooked prune pulp is. Turning to the internets, I quickly discovered that I wasn’t the only modern cook who’d been flummoxed by prune pulp, and others before me had turned to vintage cookbooks. I found one recipe that involved soaking the prunes in water for several hours, cooking them for a half-hour in the soaking water with a cup of sugar, and then letting them stand for more hours. Ain’t nobody got time for that, and besides, I’ve never encountered prunes so dry and hard that they would require hours of soaking and cooking. A similar Prune Whip recipe was published in the Dallas Observer several years ago. The writer declared that her prunes seemed soft enough that she didn’t think she’d have to cook them, and I took that as license to be lazy in my own attempt. (The article includes other fun facts about Prune Whip: it was a favorite of President Eisenhower; fruit “whips” made with beaten egg whites were popular in Britain going back to at least the nineteenth century.) In my defense, the pulp of my prunes was so soft that it would be spreadable if I scraped it out of the skins. Besides, the qualifier “chopped” suggests a chunky texture, so I just chopped up the prunes right out of the bag and added the quarter-cup of sugar indicated in the recipe. The “whip” part is a method of producing gelatin that I’ve used before and like. Lemon Jell-O was prepared in the usual way (with a little grated orange rind and salt added per the recipe), cooled over an ice water bath until slightly thickened, and then whipped to a froth with my trusty MixMaster Junior electric hand mixer. A light, fluffy lemon Jell-O is a delightful thing. Then I had to go and spoil it by folding in the prune bits. That was the tricky part. I was using the folding technique I’d learned from Julia Child – slice the spatula straight down through the fluff, fold carefully, scrape and turn, repeat – but those prune bits were sticky and a bit gooey and would stubbornly clump together. If I’d been using a traditional egg-white-based recipe, this would have been a disaster, but luckily gelatin is made of sturdier stuff. I piled the mixture into far too many dessert glasses and put it into the fridge to set. Only then did it occur to me to ask Mr. Google for some Prune Whip images so that I’d have an idea of what it was supposed to look like. The photo in the Dallas Observer seems very dark (it was made with unflavored gelatin and prune juice, so it looks particularly prune-y), and indeed my search showed that that one is not really representative. While there wasn’t much uniformity among the images (some were uncooked whips like mine, some were soufflés, and some just looked like the end result of eating prunes), I didn’t see any that looked like light-colored whip with discrete chunks of prune floating in it. “Chopped” be damned, I really should have puréed the prunes. Oh well. It’s not like this is the first time The New Joys of Jell-O has steered me wrong. We tasted Jellied Prune Whip this morning after breakfast. Whipped cream is a traditional garnish for this dish, and we’ve decided to start keeping a can of Redi-Whip in the fridge because it almost always helps. (Plus the nitrous oxide left in the can at the end is like my prize in the bottom of the box.) In this case, not so much. Bryan and I agreed that it tasted like “an old people thing”, though we couldn’t quite say why. Maybe because it tasted of resignation. Neither of us could imagine our grandparents having eaten such a thing. The prune chunks were a sort of non-sequitur in the whipped gelatin context, unpleasantly reminiscent of raisins added to foods (for which Bryan and I share a distaste), and this confirmed my suspicion that I should have puréed the prunes. Texture-wise, that would have helped, but an even mixture of whipped Jell-O and prune would have made for a worse overall flavor. Bryan didn’t think it was so bad, but for me this was one of the worse, if not the worst, of the dessert recipes so far. I generously gave him the smaller dish of Whip, and then ended up struggling to finish the larger dish. Possibly I shouldn’t have made the effort. I had a stomach virus a few days ago, and the Prune Whip confused my intestines, which have been rumbling and gurgling all afternoon and evening. As for insights into aging, Jellied Prune Whip didn’t offer any, although I spent the weekend somewhat unstuck in time. While I was making the Whip, I was listening to a Pandora station I created based on the music featured in the video game Fallout 3, a mid-century mix of post-WWII, pre-rock’n’roll pop music, heavy on the jazz and blues, spiraling out from a base of Ink Spots, Roy Brown, and Billie Holiday. Yesterday evening, Bryan and I binge-watched the entire second series of Grace and Frankie (a “dramedy” about people in their 70s) on Netflix. Jellied Prune Whip shifted from “vintage” to “antique”, and I slid from “aging” to “not really all that old after all”. I just hope that if I’m still alive in 25 years, I can rock a pair of Chucks as well as Lily Tomlin can. This is a weird one. I have a very vague recollection of having made Easy Fruit Tarts, and I even have a page of notes on it from the original Project, but it isn’t numbered, and I don’t have any pictures. Given where it appears in my notebook, I must have made it just as the burnout was setting in, and my notes bear that out. I made them with a graham cracker crust, and wound up using soy milk to make the instant pudding because we didn’t happen to have any dairy milk. (Ick.) I made the topping as fruit-in-Jell-O to save time, remarking that “I don’t revere The New Joys of Jell-O like Julie allegedly did Mastering the Art of French Cooking“. I didn’t indicate whether it was any good. I’m not sure I ever posted it. So this was ripe for a reboot. It’s simple, small tart or pie shells with a layer of pudding, a layer of fruit, and a layer of Jell-O “glaze” on top – really not so different from tarts I’ve bought at patisseries in New York and Cambridge. Over the past week I’ve been thinking about making Easy Fruit Tarts, and about its coinciding with Mother’s Day, and how I wanted to approach it in light of that. In the Your Humble Narrator page, I mention that the women of my mother’s generation in my family bought into the food processing industry’s message that making food from scratch is unnecessary drudgery, and too difficult, so processed food is the modern way to cook, and a godsend for the American housewife. As a consequence, I didn’t learn to cook from my mother. She opened boxes and cans. She thawed things. Sometimes we had pancakes for supper, or fried dough (from a store-bought stash in the freezer) with butter and sugar. Cakes, brownies and cookies were made from mixes – just add eggs and oil. The challenging part was standing on a chair to reach the mixing bowl on the counter and struggling to hold up the hand-held mixer for two minutes. When I was in high school, I started watching PBS when I got home from school, a lineup of Bill Alexander and Bob Ross (the so-called Alexander technique of oil painting) and Julia Child. I learned a little about oil painting, and so much about cooking. I think the series that was running on WGBY at that time was Julia Child and Company, and the recipes she made served to demonstrate a lot of fundamental techniques, like working with eggs, making a roux, and pastry basics. It wasn’t so much that she made it all look easy (indeed, she famously made mistakes here and there, and then explained with aplomb how to recover from them) but she showed methodically what to do and why, and made it clear that if you took care and paid attention, you too could produce choux pastry, chocolate mousse, or a soufflé. I tried some recipes, and had some success, and as I grew up and moved out on my own, I moved steadily away from always using convenience foods. I can’t remember the last time I used a boxed mix to bake a cake, let alone a tub of store-bought frosting. For a long time I’ve thought of Julia Child as “my mother in the kitchen”, and she’s who I think about, mainly, on Mother’s Day. So around comes Easy Fruit Tarts, and the recipe calls for “8 baked 3-inch tart shells (frozen, packaged, or homemade)”. I decided to opt for homemade, and, remembering the very good tarts I’ve had over the years, I selected the sweet short crust recipe from Mastering the Art of French Cooking as the foundation for Easy Fruit Tarts. Short crust is one of those simple recipes that require care and attention to do right. It’s mostly butter and flour, and you have to keep the dough cold, and try not to overwork it. I was a little intimidated, but tried to maintain focus (these types of recipes become a sort of Zen exercise). Most of the drama of making the tart shells involved buying the little false-bottom tart pans, which are kind of stupid expensive for what they are. Still, we could use them for other things, and after a long midday phone confab, Bryan agreed to pick up a set from Tags on his way home. The rest of the recipe was drama-free. I whipped up a box of instant Jell-O French vanilla pudding, which formed the bottom layer inside the tart shells. Sliced strawberries and kiwi were placed on top of the pudding, and it was all topped with thickened strawberry Jell-O. For anyone trying to make this themselves, I would recommend doubling the number of tart shells, or using larger tart shells, because I wound up with a lot of leftover pudding and strawberry Jell-O. For Mother’s Day, Bryan invited his mom over to Freak Mountain for lunch, and when she heard that “Jell-O tarts” would be on the menu, she asked him to make it breakfast instead. That’s what we did – and she doesn’t know what she missed. Easy Fruit Tarts are a bit of all right. I’m relieved to say that the sweet short crust was a success, a not-too-sweet complement to the pudding, fruit and Jell-O. As you can probably tell from the photos, there isn’t a lot of Jell-O in this dish, so it lends more flavor than texture, a good thing. I would say that in this case the whole is greater than the sum of its parts, and I’m not at all worried about this going to waste.